I started running consistently again last fall, but my longest run was only 4 miles. And so, in January of this year, CJ finally convinced me to sign up for the Toledo Glass City half marathon with him. He told me that unless I actually signed up for something and had a goal, it would be easy to keep putting it off…and he was right. So, in January I finally set my goal: to run 13.1 miles on April 25th. Therefore, I had four months to build my endurance for my first half marathon from 4 miles to 13.1 miles. As I started to run longer distances, I began to have the same phrase run through my mind again and again, “…run with endurance the race set before you…” (A quote from the bible, Hebrews 12:1). And so I began asking the question, what does it take to run with endurance, to run longer and longer distances? There are so many spiritual analogies with running, but I never fully related to them before. But for the first time in my life, I began to understand from experience what it takes to run with endurance. What Does It Take to Run With Endurance? Well, for starters, it takes setting a goal. Yep…once I set my goal, signed up and paid my money for the Glass City half marathon, I had a lot more motivation to train. So having a goal was the first step for me. Spiritual analogy: Are you just coasting through your spiritual life or do you have a purpose and a goal? Ask God what goal he has for you in your spiritual life right now. However, I also found out that running with endurance requires consistency. For years I ran here and there when I had time, but nothing consistently. When I started running again in the fall, I knew that I would need some kind of motivation to help me stay consistent. And so I invested in an iPod Nano along with the Nike+ sensor for my shoe. This system tracks my pace, distance and time of each of my runs. It then syncs them with my online account so I can see my progress. Not only that, but after my fastest recorded runs, I hear Tiger Woods say, “Congratulations, that was your fastest run yet!” And then I hear encouragement from Lance Armstrong after my longest runs cheering me on. Spiritual analogy: It takes consistent time with Jesus to grow closer to Him and experience His presence and His power in your life. Have you been spending consistent time with Him lately or has it just been hit or miss when you have nothing else to do? Ask God to empower you to spend more consistent time with Him. This could be through prayer, reading His word, spending time in silence, worshiping Him through music, sitting with Him in nature, taking prayer walks, dancing before Him, etc. Something else I learned in training for my first half marathon is that running with endurance is much easier when running with a group. CJ and I decided to join the Findlay Striders and Toledo Roadrunners clubs this year. We run with the Striders at their monthly meetings and occasionally make the Saturday morning 8@8 runs. We also head up to Perrysburg on Thursday nights for the group run at Second Sole. My longest run before the half marathon was 11 miles. The week before, it had been long and torturous to run 9 miles by myself. Therefore, I decided to run with the Striders on a Saturday morning…and was I ever glad I did. Not only did I finish my 11 miles that day, but it went by quickly as I chatted with several other runners that were running around my same pace. And I didn’t dread each additional mile like I did when running alone. Wow…what a difference the group runs made! Spiritual analogy: Running the spiritual race set before us with a group of other believers is so much easier than running it alone. Do you have someone in your life that is running this race along with you? If so, thank God for them and keep it up! If not, pray and ask God to provide someone for you. And finally, I found out that running with endurance requires adequately fueling my body. Just like a car needs fuel to run, my body needs fuel to keep going those extra miles. I realized that as I ran longer distances, staying hydrated and eating enough calories was crucial. There were a few days that I felt like I “hit the wall” and had no energy left. After thinking it over, I would realize I didn’t eat enough prior to that long run. Taking CJ’s advice, I decided to eat about 2-3 hours before my long runs and then bring an energy gel or two with me. Not only that, but I learned that re-fueling my body after I finished a long run was just as important. We use Hammer Nutrition’s Recoverite as our recovery drink and I know that it has helped my body re-build and recover much quicker after my long runs. Spiritual analogy: How are you fueling your mind for the spiritual battle? Are you taking in the junk food of the world through negative media choices (TV, music videos, movies, internet choices, music, video games, etc.) or are you renewing your mind with God’s word? I had decided to run my first half marathon with a purpose. I decided to raise money for Haiti where I had volunteered as a P.T. after the earthquake. However, a couple weeks before the race I started to get some right knee pain. It seemed to be my iliotibial band, the dreaded ITB tendonitis that is familiar to many runners. And I hit a low point. After months of training I didn’t know if I would be able to run in the race. The pain would get so severe that I would start limping after only a few miles. I decided to try a few treatments of the active release technique with Dr. Lofquist and it helped to significantly decrease my pain, although it never fully went away. I had already raised money for Haiti and didn’t want to back out of the race due to this injury. Therefore, on race day, I decided to use the Galloway technique - running five minutes and then walking one minute. This allowed my body time to recover in between the running. And not only did I finish, but I finished 7 minutes faster than my target pace! Spiritual analogy: When obstacles come into your life are you easily giving up or do you press through and ask God to help you overcome any obstacle the enemy may place in your path? My husband, CJ, finished his race and then came back for me. He ran the last couple miles with me and cheered me on as I crossed the finish line. What a rewarding feeling to cross that finish line on April 25th after running 13.1 miles, knowing that I had just achieved my goal…I had run with endurance the race set before me! Beautiful and So True .. This article is BEAUTIFUL and so so true with truth. Thank you for sharing with us your expereince which creates within me to build and to work toward running with endurance the race set before me. I love the spiritual references you have included ... This is what the journey is all about for me, along with staying concious of the spiritual nuggets included. THANK YOU SO MUCH! I use to live the Toledo area when I was a teenage. I loved the waterfront into down town and part in the parks on Friday Evenings through out the summer months. Be Blessed, Thank you too for the opportunity to remember the community I once called "home". The Glass City, The Toledo Rockets, etc. etc. Wow Shelley, this is too cool. Way to go, running faster than your target pace AND completing the half AND raising the money AND running through that pain! Not to mention volunteering in Haiti, that is amazing. 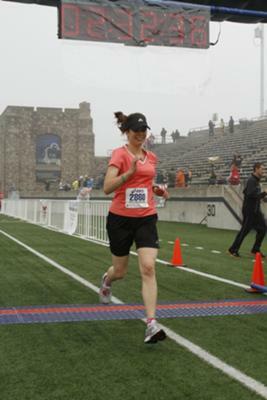 2) I had severe knee pain a few weeks before the race and didn't know if I could make it, either! God is bigger than everything we attempt on our own, isn't He? Absolutely loved your post - the analogies were so true. You go Shelley, what an inspiration you are, I've already forwarded your story to my "running partners" - my sisters in Christ. This will definitely inspire us to continue on with endurance for the race set before us all! Blessings Shelley and thanks again for sharing your testimony!